Update 3/8/08: Genesis' friend CS provides more details about the accident. Turns out Genesis was a passenger, not the driver (See his e-mail below). Update 8/16/07: Nothing at all remains of this monument ... except these photos. 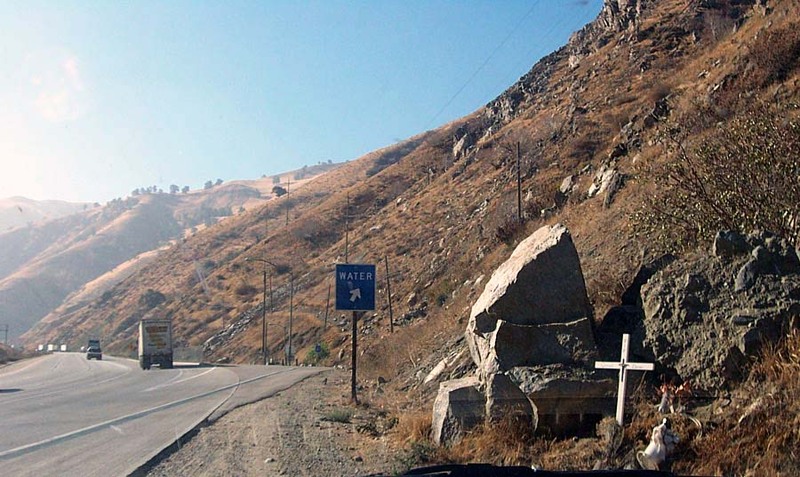 Description: This large white cross greets visitors traveling to L.A. from Central California. A crucifix is attached to the center of the cross, and dead flowers surround the monument. A white flower basket stands lonely vigil. The large boulder seems largely undamaged from the accident (Let that be a warning, kind visitor: Boulders always win!). This one isn't so much of a case. Basically the records state that Genesis simply lost control of his vehicle at approximately 8:50 am on the morning of May 20, 2001. No other vehicles were involved. This one is pretty straight forward, he simply was driving along at a speed of 65 mph and lost control and hit the "Rock o' Doom". Oh, and just to let you know, no hydroplaning was involved in his demise either. Road conditions were dry at the time, and the weather was perfect. No high winds were a factor as well. Maybe a rabbit jumped out in front of the car or he was changing his radio station and wasn't paying attention to the road? Just a case of really bad luck I suppose, only Genesis knows for sure." "I knew Genesis. It might help to know that he was not the driver, but a passenger. His friend, the driver, fell asleep, back from a long trip from northern California. Apparently, he slid under the seatbelt (the passenger-side seat was leaning very low) and passed away in the helicopter on the way to the hospital.